Based on the anime series, the Mobile Suit Gundam Thunderbolt manga is being released by Viz Media. The first volume releases on November 15th. Set in the Universal Century 0079, a rivalry blooms amidst a war between Earth and Zeon over the Thunderbolt Sector. For more information about the series and the acquisition, including pricing, Viz provided a press release. San Francisco, CA, November 7, 2016 – VIZ Media, LLC (VIZ Media), a premier company in the fields of publishing, animation distribution, and global entertainment licensing, unleashes a fresh take on the classic Gundam universe with the release of MOBILE SUIT GUNDAM THUNDERBOLT on November 15th. The new manga series created by Yasuo Ohtagaki delivers an action-packed, character-driven story set in the distant future where the forces of the Earth Federation fight to quell an uprising by the rebellious Principality of Zeon. The preeminent weapons in this struggle are massive robots with human pilots called Mobile Suits. MOBILE SUIT GUNDAM THUNDERBOLT will be published in print under the VIZ Signature imprint and is rated ‘T+’ for Older Teens. Volume 1 will carry an MSRP of $14.99 U.S. / $19.99 CAN. Future volumes will be published on a quarterly basis. As the first volume opens, two veteran Mobile Suit pilots leap into this maelstrom of destruction: the deadly Zeon sniper Daryl Lorenz, and Federation ace Io Fleming. It’s the beginning of a rivalry that can end only when one of them is destroyed. The lightning-streaked debris fields are about to become the stage for an epic duel where death is the only true winner. 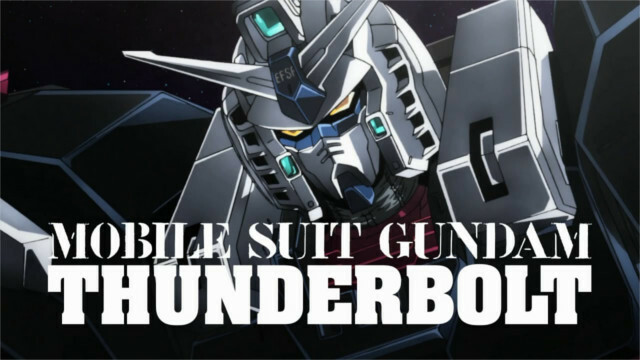 For additional information on MOBILE SUIT GUNDAM THUNDERBOLT and other manga titles distributed and published by VIZ Media, please visit www.VIZ.com.